A Quote: It isn't what happens, it's how you deal with it. I use to love celebrating this day when I was a child growing up in America. A day of good company, good food, fireworks at night and a midnight swim. Now I wonder at the complexity of life and the paradox of feelings that arise in me about this day. Not only does this day represent Freedom from British Rule for the American Colonies, it also represents the Freedom of the Philippines from America as one of its colonies. The bittersweet irony of the day. On beha1f of the United States of America, 1 do hereby recognize the independence of the Philippines as a separate and se1f-governing nation and acknowledge the authority and control over the same of the government instituted by the people thereof, under the constitution now in force. IN WITNESS WHEREOF , I have hereunto set my hand and caused the seal of the United States of America To be affixed. DONE at the City of Washington this Fourth day of July in the year of our Lord, nineteen hundred and forty-six, and of the Independence of the United States of America the one hundred and seventy-first. Take a look here for some very good information regarding Philipine History, the land and the people. Moving beyond the past, not to forget, but to know what is and begin a new day, a new way with vision and commitment to a sustainable future for all. Today I am grateful to celebrate freedom. In a way it is celebrating me...my ancestors and the ancestors of the land I live on. Following the success of last year's rewoven Goddess Conference, in 2003 we will once again be making collective and individual pilgrimages to the Goddess throughout the course of the Conference. We will be journeying physically, emotionally, psychically and spiritually into the Heart of Her Mysteries as they present themselves here in Avalon in the sacred landscape and within the forms of the Nine Morgens, who are the Nine Ladies of Avalon. In legend the Nine Morgens are Nine Sisters, Faeries, Fates, Goddesses, Ladies, Crones or Crows, who rule the Isle of Avalon. The most famous is Morgen La Fey - Morgen the Faery or Morgen the Fate, who in Arthurian legend was Morgana, the maligned half-sister to King Arthur. However She is so much more than this, and She has eight Sisters of whom little is known. During the Conference we will be exploring the true nature of the Nine Morgens as Goddesses of transformation, as Sisters working in circle, as Healers, Muses and Guardians of Avalon. Our purpose is to bring them forth from the mists of our forgetting, so that we can recognise and honour these ancient Goddesses of Avalon once again. 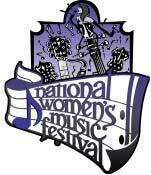 We will also be exploring the themes of Sisterhood and Cooperation between women, and between women and men. Our Pilgrimage journey includes Conference favourites - baking Lammas bread, singing, dancing, the Goddess in the Cart procession and all the fun we usually have, and there are new experiences of Her Mysteries which we hope you will enjoy. As usual participants will be supported in Pilgrimage Circles of 13 and we ask for your cooperation in welcoming Conference newcomers as well as old friends, so that everyone has companions on this journey of exploration into the Mysteries of Avalon. We ask for the blessings of the Nine Morgens on our Conference. Kathy Jones is the cofounder and coorganiser of the Glastonbury Goddess Conference. She is a writer, healer, initiator, sacred dramatist and Priestess of Avalon. 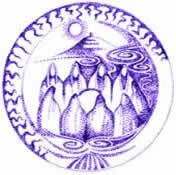 She teaches a three year training for people to become Priest/esses of Avalon and trainings in Esoteric Soul Healing. She loves witnessing people unfolding and flowering, and adores the Goddess in Her many forms. She is a founder of the Glastonbury Goddess Temple, the first public Goddess Temple in Europe for perhaps a thousand years. Tyna Redpath is the cofounder and coorganiser of the Glastonbury Goddess Conference. She is a Wonderwoman who brings her many creative gifts to the Goddess and the Conference. She is the owner of the pioneering Goddess and Green Man shop, which can be found in Glastonbury's High street. One of the first Goddess shops in the UK it offers Goddess books and items for altars, practice and decoration. Tyna is also an excellent craftswoman in her own right. On May 3rd, 2003 , The Works n Shirts Project invites you to take part in "WEARNICA", an international exhibition of artistic reactions to war. On the day of the event, participants in cities around the world will form walking art galleries, wearing original works they've created on the backs of white dress shirts into museums and monuments, parks and shopping malls to help raise public awareness of the realities of war in our time. 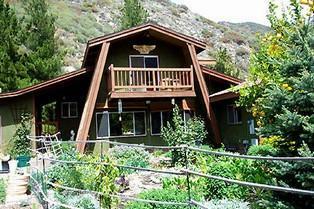 Raymond posted an article about the ENature Habitat page we set up for our house last year. It is great fun to log what is in your back yard and local vicinty. Living in the Los Padres National Forest, we see a lot of life. You can tell Spring is here with flowers blooming everywhere, bird, bees, butterflies grace the breezes. We have started our Spring planting, with three new trees, almond, avocado and a grafted 4 in one apple tree. Every day we weed. (By the way, a weed is any plant growing where you don't want it to be growing.) In permaculture the plants that reseed them selves are called "volunteers" which you just move around to where you want the to grow. I am looking forward to this future feature! For now take a look at this Fotolog " a website that lets you easily put your digital photos on the web in a daily log format. If friends/family have their own Fotologs, you can see everyone's latest photos on one page and link back and forth to each other. And, you can comment in each other's guest books. Why use Fotolog if I can just email photos to my friends and family? Ming, maybe you can create a link or feed into your sidebar rather than write more code on your own. I would like to see more of your pictures as your travel. Safe Journey! Here is a follow up to an article I posted on March 25. Seems Takoma is a conscientious objector. Takoma's role was to sweep the way clear for the arrival of the Royal Fleet Auxiliary, Sir Galahad . 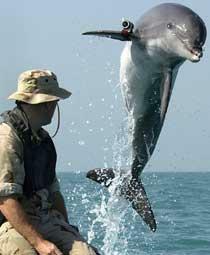 US officials had said that dolphins, first used in Vietnam, were a far better bet than all the technology on board the flotilla of ships. 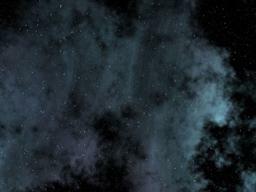 Julie posted some interestings stories about Space Dust and the Pullman Dark Matter trilogy. For the last several years I have been facinated by sun spots solar flare activity and geomagnetic storms. Many thanks to Jeff Gordon from NCN and The Well Now Project, who introduced me to these celestial happenings. He has a link on his site for Today's Space Weather which I found really informative and useful. The Sun goes through cycles of high and low activity that repeat approximately every 11 years. The number of dark spots on the Sun (sunspots) marks this variation; as the number of sunspots increases, so does solar activity. Sunspots are sources of flares, the most violent events in the solar system. In a matter of minutes, a large flare releases a million times more energy than the largest earthquake. Episodic solar activity has a number of effects that are of interest to us. A radiation dose from energetic particles is an occasional hazard for astronauts and for electronics on satellites. Geomagnetic field disturbances may damage power systems, disrupt communications, degrade high-tech navigation systems, or create the spectacular aurora (Northern and Southern lights). SEC provides warnings of these events and continues the solar monitoring that began 400 years ago with Galileo's invention of the telescope. Solar flares are tremendous explosions on the surface of the Sun. In a matter of just a few minutes they heat material to many millions of degrees and release as much energy as a billion megatons of TNT. They occur near sunspots, usually along the dividing line (neutral line) between areas of oppositely directed magnetic fields. Flares release energy in many forms - electro-magnetic (Gamma rays and X-rays), energetic particles (protons and electrons), and mass flows. Flares are characterized by their brightness in X-rays (X-Ray flux). The biggest flares are X-Class flares. M-Class flares have a tenth the energy and C-Class flares have a tenth of the X-ray flux seen in M-Class flares. The National Oceanic and Atmospheric Administration (NOAA) monitors the X-Ray flux from the Sun with detectors on some of its satellites. One to four days after a flare or eruptive prominence occurs, a slower cloud of solar material and magnetic fields reaches Earth, buffeting the magnetosphere and resulting in a geomagnetic storm. These storms are extraordinary variations in Earth's surface magnetic field. 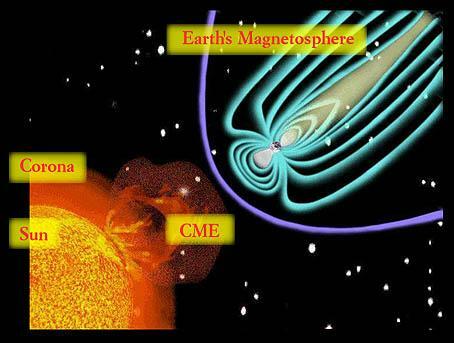 During a geomagnetic storm, portions of the solar wind's energy is transferred to the magnetosphere, causing Earth's magnetic field to change rapidly in direction and intensity and energize the particle populations within it. We are part of the "particle population" on planet Earth, few of us have mastered the "wave aspect". Jeff and a few others members of NCN have been tracking these events and how the translate in our personal lives over the last several years. It seems that we each respond to the events in different ways, some need more sleep, some are all charged up - energized in a good way, some are aggitated or angry, tense or stressed out. There is a growing body of evidence that changes in the geomagnetic field affect biological systems. Studies indicate that physically stressed human biological systems may respond to fluctuations in the geomagnetic field. Interest and concern in this subject have led the Union of Radio Science International to create a new commission entitled Electromagnetics in Biology and Medicine. Possibly the most closely studied of the variable Sun's biological effects has been the degradation of homing pigeons' navigational abilities during geomagnetic storms. Pigeons and other migratory animals, such as dolphins and whales, have internal biological compasses composed of the mineral magnetite wrapped in bundles of nerve cells. While this probably is not their primarily method of navigation, there have been many pigeon race smashes, a term used when only a small percentage of birds return home from a release site. Because these losses have occurred during geomagnetic storms, pigeon handlers have learned to ask for geomagnetic alerts and warnings as an aid to scheduling races. It has been realized and appreciated only in the last few decades that solar flares, CMEs, and magnetic storms affect people and their activities. The list of consequences grows in proportion to our dependence on technological systems. The subtleties of the interactions between Sun and Earth, and between solar particles and delicate instruments, have become factors that affect our well being. Thus there will be continued and intensified need for space environment services to address health, safety, and commercial needs. Until I read this primer today, I had an intuitive sense that we were being affected by these solar activites. The pressure seems to build, with some of the people I know feeling a hightened sense of anxiety, pressure even prior to an event and some immediately afterward and some still do not feel the anything until the wave of particles hit our planet. We try to make meaning of all of this additional 'feeling', find the reason for why we are feeling the way we do. Maybe it is just a solar flare and not your partner's behavior afterall! The jury is still on how we are being influenced/affected, though more evidence shows that solar activity does affect us some how. Sebastopol, Calif. (March 31, 2003) – With the U.S. military invasion of Iraq underway, the government’s Drug Enforcement Administration (DEA) is waging a controversial war on another front and hoping that the public is too distracted to notice. On March 21, 2003, the DEA issued a final rule regarding the legality of hemp foods – whose popularity is growing rapidly – in the United States. The new rule seeks to ban the sale of all hemp food products and to prohibit the importation of hemp oil for cosmetic manufacture. The effective date of the final rule is scheduled for April 21, 2003. Yet, according to hemp food supporters, the DEA is trying to regulate “a grain of sand in a whole truckload.” Says John W. Roulac, hemp author and founder and president of hemp-food manufacturer (http://www.nutiva.com|Nutiva}. 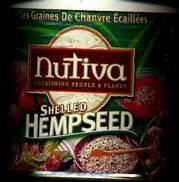 Congress exempted non-viable hemp seed and oil from the Controlled Substances Act (CSA – see 21 U.S.C. 802(16)) because it recognized that trace concentrations of THC, the psychoactive ingredient in marijuana, in hempseed are insignificant (at a few parts per million) and non-psychoactive. The hemp exemption was provided in the same manner that Congress exempted poppy seeds from the CSA, despite the fact that they contain trace opiates otherwise subject to control. “One would think that the Bush Administration's DEA has more important things to do than attack America’s growing hemp-food industry,” says Roulac. “Hemp is a health-promoting, non-drug, earth-friendly crop for food and fiber that can help create new jobs and add to farmers’ income,” he adds. America’s leading hemp food brand, Nutiva, offers certified-organic hemp and flax food bars, organic hemp oil and shelled hempseed. In 1999, Nutiva introduced the first hemp food bar in the U.S. and has since sold more than two million bars. Sadako Sasaki, a young Japanese girl, on the threshold of adolescence, developed leukemia in 1955, from the effects of radiation caused by the bombing of Hiroshima. While hospitalized, her closest friend reminded her of the Japanese legend that if she folded a thousand paper cranes, the gods might grant her wish to be well again. With hope and determination, Sadako began folding. 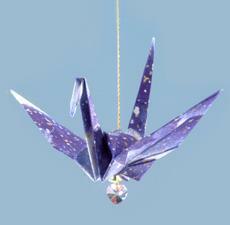 Learn how to fold your own cranes.